Dr. Sharma is internationally renowned for her distinguished achievements as a researcher, academician and a major figure in biotechnology and government affairs. Born in 1940 and trained as a Plant Scientist; she earned her Ph.D. from Lucknow University in 1961. Her post-doctoral research at Purdue (1967-1968) with Dr. A. Carl Leopold and Richard Hall on latex-bearing plants led to a direct commercial application in rubber plantations in Malaysia. Presently, she is the Founder, President and Executive Director of the Indian Institute of Advanced Research in Gandhinagar. In 1974, she began working in the Department of Science and Technology, from there she went on to the Planning Commission, and the Office of Scientific Adviser to the Prime Minister. Most notably, she served as the Secretary of the Department of Biotechnology for eight years. She has been conferred Honorary Doctorates by at least nine universities. Dr. Sharma has served in leadership positions in many Indian and international scientific societies. She was the General President of the Indian Science Congress Association in 1988; President of the Association of Microbiologists of India (1999) and President of Vigyan Parishad, Prayag. Dr. Sharma was also the President of the Indian National Academy of Sciences and has been the recipient of numerous prestigious awards and honors, such as the 2006 NASIs Platinum Jubilee Gold Medal for Lifetime Contributions and the Norman E. Borlaug Award. After completing her tenure as Secretary of the Department of Biotechnology in February 2004, she was appointed Adviser to the Minister of Science & Technology and became guest faculty at IIT Delhi. She is the Principal Adviser on Biotechnology to the State Governments of Gujarat and Uttaranchal. In addition to her work, she has dedicated more than 30 years to spreading the message of science to young students, scientists and in particular to women. In 2004 she was elected as the first Chair of the International Council for Science's Forum on Science for Women. 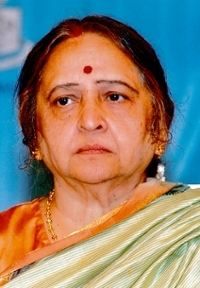 Dr. Sharma was the first woman president of the Indian Academy of Science.